Boerne City Hall is located at 402 East Blanco Road, Boerne, TX 78006; phone: 830-249-9511. Photo: Joseph Dienger Store and Residence, ca. 1884, 106 West Blanco Road, Boerne, TX. 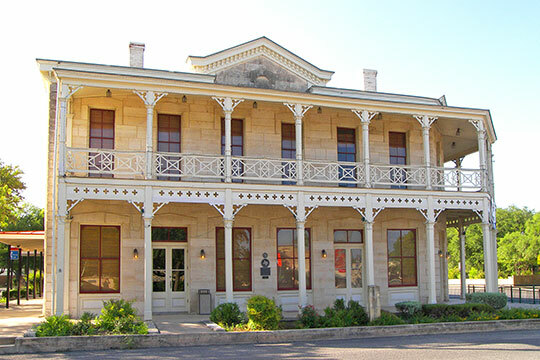 A Texas Historic Landmark plaque reads: This limestone commercial structure was built for Joseph Dienger (1859-1950) shortly after he purchased the site in 1884. The ground floor housed his grocery and the second floor provided living quarters for his family. A later addition was used for the dry goods store of Dienger's sisters Lina and Louise. Owned by family members until 1967, the double galleried building features Victorian styling with German influences. Listed on the National Register of Historic Places in 1984. Photographed by user:Larry D. Moore (own work), 2009, [cc-by-3.0 (creativecommons.org/licenses/by/3.0)], via Wikimedia Commons, accessed March, 2015.